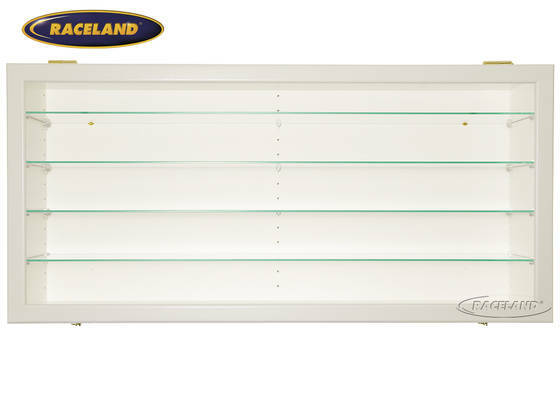 The product "Display cabinet Raceland 100% dustproof display horizontal, color white" was successfully added to your wishlist. With more than 25 years of experience in the collectors market we can state that there is no favourable out of the box solution to display your models 100% dust free. The sliding glass doors of cheap displays or the doors of glass cabinets fixed on hinges are an invitation for dust to cover your valuable models. The interior lighting with its high temperature frequently causes bad damage to the decals of your models. 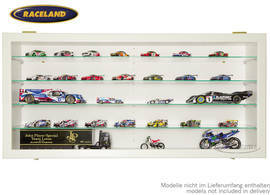 Not for no reason most model car manufacturers print corresponding warning notices on their packaging.Bearing this in mind we have developped 100% dustproof wooden display wall cabinets years ago in cooperation with a German cabinet maker to offer you a 100% dust free solution for your valuable collection. Our cabinets are hand made in Germany and finished to a very high standard using quality massive limba wood only. Front doors and carcasses are adapted individually with each cabinet to ensure that the seamlessly integrated seal is pressed over its complete length when the front door is closed and fixed. Thus not the slightest gap will be left for dust to get in. Your models will keep their finish and value even after many years. This horizontal type of display is mainly intended to keep your valuable 1/18th scale models and with 4 glass shelves installed it will carry 15 large 1/18th scale models on 5 levels. 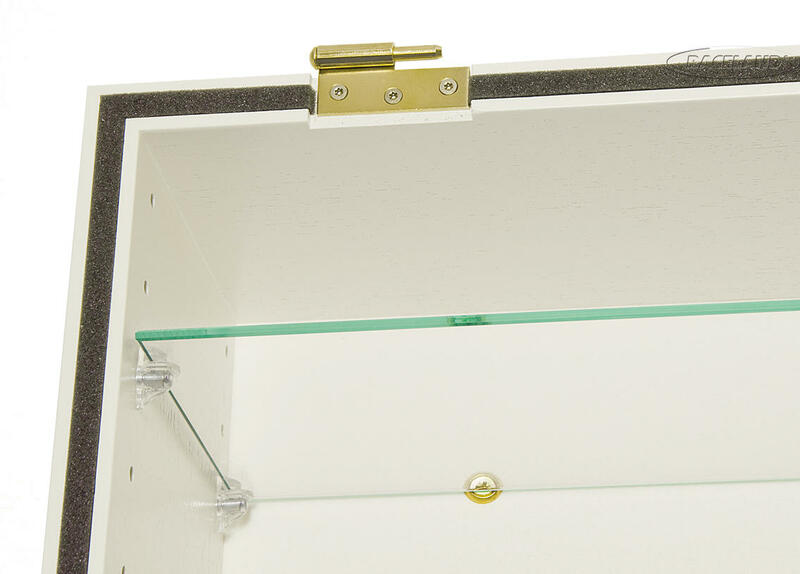 The 5th glass shelf that comes with this cabinet enables you to either create two lower levels for helmets or other accessories or to reduce the distances between the shelves throughout e.g. when using this cabinet for 1/43rd scale models or similar items. 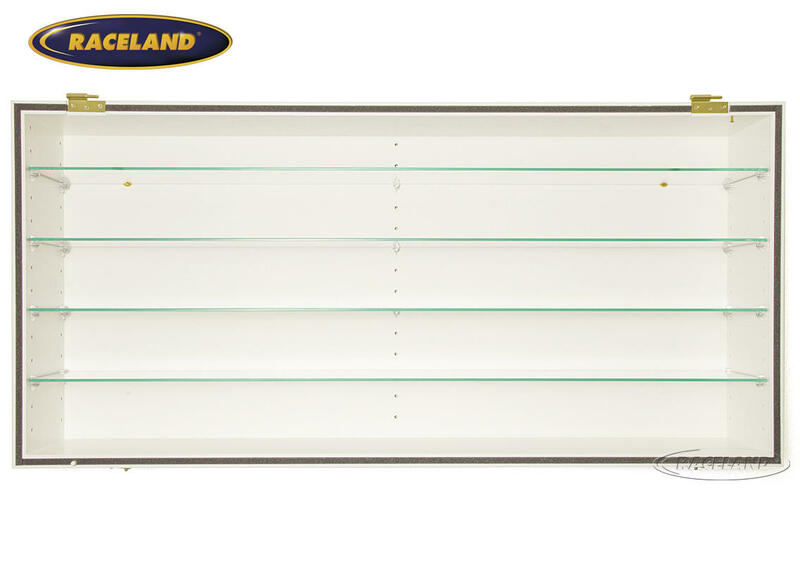 The lateral and the additional central shelf supports can be adjusted in a grid of 32.5 mm and offer you various possibilities to create the perfect space for your collection. Each shelf offers a useable depth of 150 mm. Technical information: Massive limba wood painted white used for door frame and carcass, real glass front, glass shelves with polished edges, back covered with white cloth. 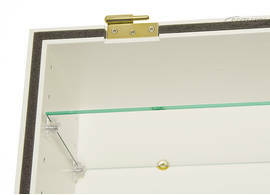 Shelf supports and fastening material such as screws and wall-plugs included, dust seal. Outer dimensions: 50 cm high, 105 cm wide, 18 cm deep. Useable inside depth of glass shelves 15 cm. Brass hinges. Special transport packaging. Shipment in two separate parcels. Special shippings costs by DHL within Europe are € 49.00 as total for both parcels. Sorry no overseas shipping for this item.